“As a small business owner myself, there’s nothing I enjoy more than hearing from one of my clients their sincere appreciation for someone on my team. With that said, I would like to express how impressed I am with Lauren Dobelbower. Although we’ve only worked together for 3 hours so far, I wanted you to know that her knowledge of training dogs, professionalism, timeliness with appointments and answering my occasional email questions is just outstanding. I know from being in business around 20 years that finding excellent employees is a very difficult task. Lauren came right into my house sat down, and got right to business. My 7 year old, 25 lb mutt, whom of course I love and adore, has become extremely fearful and very unsociable with dogs which show by her excessive barking. I have softened over the years and unfortunately just let her go with it. However, since she comes to my office every day with me, she has become a daily distraction with her barking at anyone that comes in the front door or passes by our office. I picked your card up at my Vet and of course I knew your company name, as I feel we met about 4 years ago or so at an event you did at the SPCA in Owings Mills, MD. Anyway, I decided on your company after I read your website and saw the experience and education of some of your trainers. After only 2 training session and a little bit of work for both my dog Ellie and myself, I’m happy to say that she is so improved that my staff is asking me what happened to her. In addition, I can now ride in my car in peace and quiet and I don’t have to be embarrassed that she will bark her head off when a car pulls up next to us. I can’t tell you how much more enjoyable it is to now spend time with Ellie. 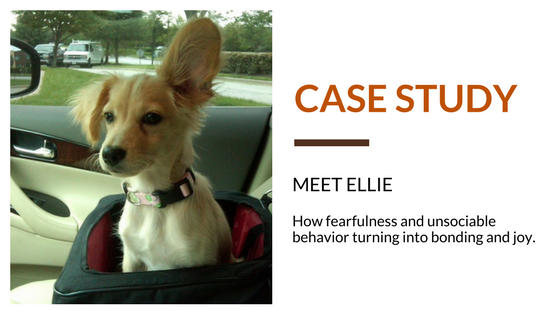 We are also working on Ellie’s fear of flies in the house. Lauren is training me to help Ellie become less fearful and even said she would somehow catch a fly and bring it with her; now that is going above and beyond, hahaha. I look forward to working with Lauren the next few session and I am so confident that she will train me how to train Ellie to be the dog I’ve wanted from the beginning. Already I can feel the bond between Ellie and I getting stronger every day.